AmeriCorps St. Louis' Emergency Response Team consists of a highly skilled and thoroughly trained group of diverse individuals from all over the country. We utilize trainings from the National Incident Management System and best practices from Voluntary Organizations Active in Disasters so that each member is fully equipped and ready to deploy to impacted communities on a moment's notice. In the immediate aftermath of a disaster, members of the Emergency Response Team focus on the critical unmet needs of the affected community, particularly those of vulnerable populations. Throughout a deployment, members could be involved in any of the following: individual assistance, public assistance, volunteer management, donations management, community outreach, and capacity building. Members offer individual assistance by providing structural repairs after disaster, including emergency roof tarping & home repair, mold remediation, muck & gut of affected properties, debris clean-up, and demolition. 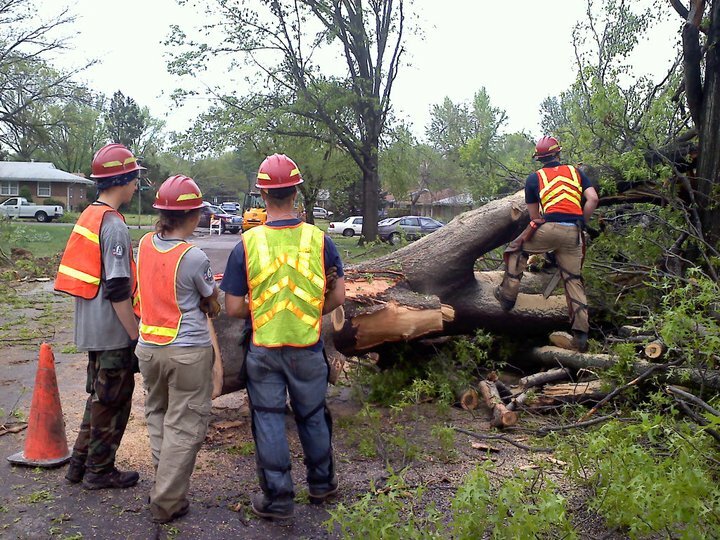 After the tornado struck down in Moore, Oklahoma in 2013, AmeriCorps St. Louis assisted in helping 6,729 property owners throughout the recovery process. Emergency Response Team Members provide public assistance by facilitating hazard tree removal, debris removal, safety briefings prior to field work, dispatch operations, and donated equipment and heavy machinery tracking. When a flood disaster is imminent, Members assist communities in flood fighting techniques by sandbagging and sump-pumping. Prior to the Mississippi River flooding in Clarksville, Missouri, in 2013, AmeriCorps St. Louis, with the help from volunteers, constructed sandbag walls around the town, averting floodwaters from the residences of 442 individuals. Members provide volunteer management by organizing and operating Volunteer Reception Centers and utilizing systems to track volunteers, including location and hours served, activity performed, and equipment used. During the 2011 Joplin tornado, AmeriCorps St. Louis mobilized 63,620 volunteers and tracked over 633,465 hours of volunteer service. Emergency Response Team Members facilitate donations management by managing warehouses, being a Point of Distribution Tracking and Coordination site, and developing methods for tracking goods that are donated. 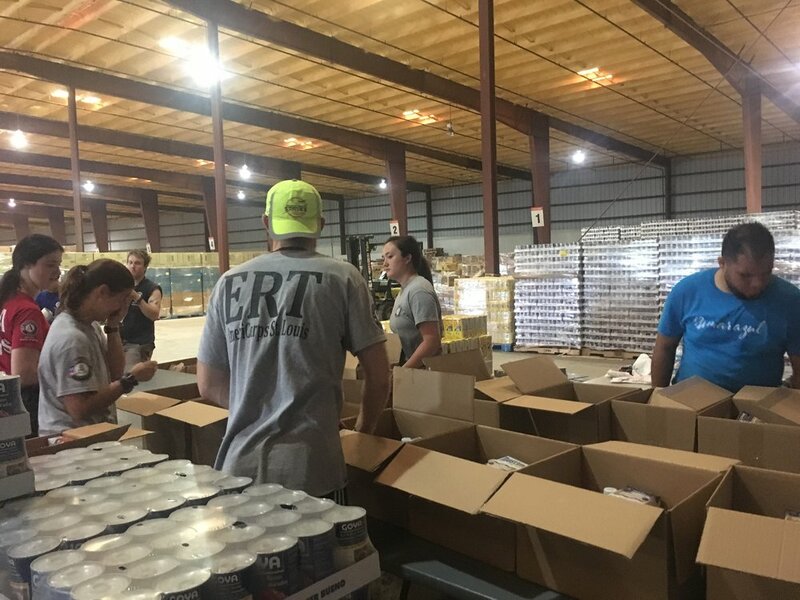 AmeriCorps St. Louis assisted in sorting and managing 2,000,000 pounds of donations throughout three warehouses in Sevier County, Tennessee, after the 2016 wildfires. AmeriCorps St. Louis supports community outreach by canvassing in affected communities, supporting 2-1-1, running call centers for survivors, providing homeowner and property owner intake and tracking, facilitating case work and Multi Agency Resource Center (MARC) support, and providing staffing for logistics. During the 2017 spring flooding in Missouri, AmeriCorps St. Louis traveled throughout the state to staff registration and homeowner intake tables at 18 MARCs over a period of 10 days. Members assist in capacity building by acting as support and liaisons for emergency management agencies, including Voluntary Organizations Active in Disaster, Community Organizations Active in Disaster, and Long Term Recovery Committees. Other organizations include the Federal Emergency Management Agency, United Way, American Red Cross, Salvation Army, faith-based organizations, as well as other state and local committees.